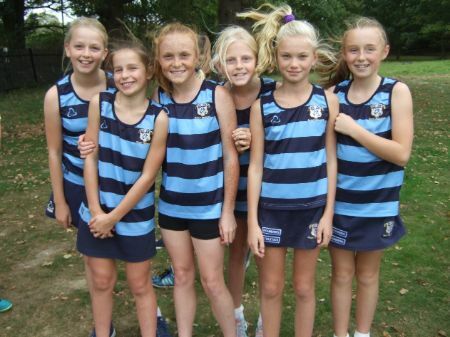 For three of the four U11 girls, this was their first experience of the 2.2km course, as, due to netball fixtures, the U9s do not compete at this event. Music commitments prevented us fielding a six-to-score team, but huge credit must go to our ‘team’ of Lottie H (25), Lottie B (42), Sydney W (47) and Clara S (111) who still managed to finish twelfth of the eighteen teams (the final two places scoring 121 and 122 as ‘last’). The girls ran with real determination on a course that included a long energy-sapping climb of 300m, followed by an almost vertical 50m hill. Powering down the home straight, all four girls finished strongly and should be very proud of their performances! The U13 girls almost had ‘coach’ in tears, such was the pride she felt in the way they attacked the brutal 2.8km course. Having tackled the two climbs already mentioned, they came into the home straight, only to be diverted on an extra 400m loop, which included another leg-taxing ascent, before the final downhill and turn into the funnel. All six girls ran their hearts out, the pain evident as they pushed every ounce of energy from their tired bodies. Bea W ran an amazing race at the bottom of the age group to cross the line in tenth place. Jemima S looked strong and determined (32) and Lottie C (49), Lettice A (51), Freya G (52) and Chloë Lee (53) showed that they had learned from the ‘secret sprinter’ training session, packing really well and pushing one another on to finish in the top two-thirds of the field. Wonderful performances from all the girls – well done!